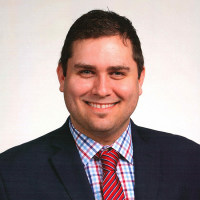 Adam Smeets joined Indian Prairie School District 204 in 2018. Previously, Smeets worked to support all facets of technology at Dominican University where he served as Assistant Vice President and Deputy Chief Information Officer. Under his leadership, the technology department developed and maintained continuous efforts to improve operations including the development of a Support Center, decreasing case resolution turnaround times, and streamline processes while providing quality services to students and faculty. Prior to joining Dominican, Smeets managed labs and student technologies for Loyola University as the Manager of Digital Media Services and earlier served as the Assistant Director of Technology for University of Delaware. He earned his bachelor's degree from Loyola University Chicago, his master's from the University of Delaware and is working on his curriculum and instruction-focused doctoral dissertation from Loyola University Chicago.